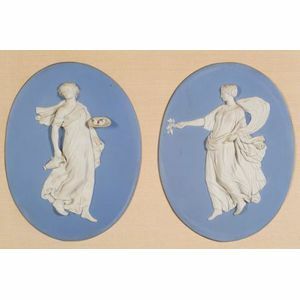 Pair of Wedgwood Solid Light Blue Jasper Plaques England, late 18th/early 19th century, oval shape with applied white Herculaneum figures in high relief, impressed mark, (raised dish off and simply reglued), 7 3/4 x 10 1/4 in. ; mounted together in a silvered wood frame. 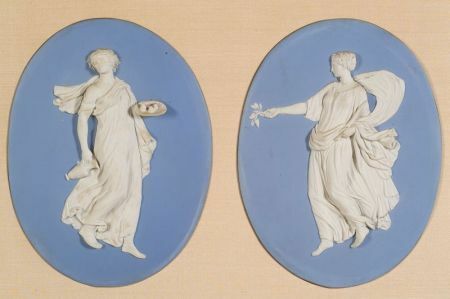 Literature: Similar illustrated in The Dwight and Lucille Beeson Wedgwood Collection at the Birmingham Museum of Art, by E.B. Adams, color plates 67 & 68.